The man accused in the shooting death of Chicago Police Department 18th District Cmdr. Paul Bauer has pleaded not guilty on dozens of felony counts. 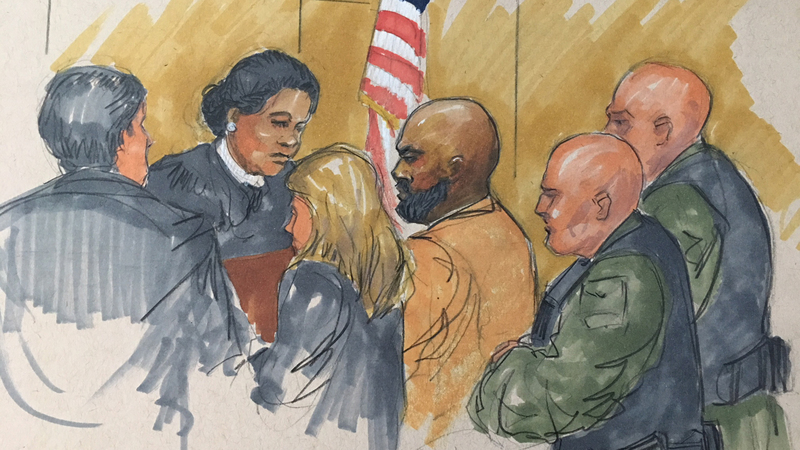 Shomari Legghette, 44, entered the pleas on 56 total charges including first-degree murder Monday morning as CPD Superintendent Eddie Johnson and a dozen or more 18th District officers looked on inside the Leighton Criminal Court Building. Johnson was flanked by several officers who filed into the viewing gallery of Cook County Judge Erica Reddick’s courtroom to observe Legghette’s arraignment. “I was just at the arraignment of (Bauer’s) murderer and I hope he never, ever, ever sees the light of day,” he said during a press event at CPD headquarters following the hearing. A grand jury returned an indictment last week against the four-time convicted felon, who has been held without bond since his arrest moments after the downtown shooting in February. Legghette told Reddick he is unable to afford a private attorney and she appointed a public defender to handle his case. Reddick on Monday also granted a state request to implement a “decorum order,” barring the public release of any audio or video evidence and other reports related to the case. Given the location of the incident – a high-profile shooting just outside the Thompson Center – prosecutors believe there could be more video evidence of the shooting that has not yet been discovered. They feel that if that evidence were to be made public, it could interfere with their ability to properly vet the information. Cook County Public Defender Kathleen Moriarty pushed back against the order, calling it “overly broad” and saying it could hamper their ability to craft a defense for their client. The judge acknowledged those concerns and said she’ll grant them leave to offer amendments to the order at a hearing next month. Decorum orders have been increasingly used in high-profile criminal cases including the trials of CPD officer Jason Van Dyke and of two former university professors charged in the stabbing death of a male hair stylist. Attorneys from both sides declined comment following the hearing. First District officers first spotted Legghette during a narcotics operation on Lower Wacker Drive on Feb. 13. When they approached him to talk about recent drug sales and a shooting that had occurred in the area, he immediately fled toward State Street. It was there Bauer sat in his vehicle awaiting a meeting with city aldermen. Bauer heard a description of Legghette over the radio, spotted him and took off on foot, pursuing him to a stairwell at the Thompson Center. Legghette was then seen pulling Bauer into the stairwell where he allegedly fired seven shots from a semi-automatic handgun, killing the 31-year department veteran. Legghette is due back in court for a status hearing April 18. He faces a possible life sentence if convicted. Feb. 15: A Cook County judge has denied bond for Shomari Legghette, a four-time felon charged with first-degree murder in the shooting death of Chicago Police Department Commander Paul Bauer this week. Feb. 14: The Chicago Police Department on Wednesday continued mourning the loss of 53-year-old Commander Paul Bauer a day after he was shot and killed in the line of duty. Feb. 13: “It’s a difficult day for us, but we will get through it,” an emotional Police Superintendent Eddie Johnson said Tuesday following the shooting death of 18th District Commander Paul Bauer.